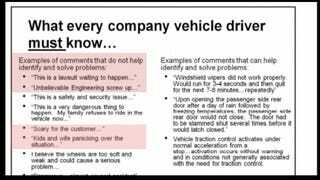 If there's a smoking gun in this whole GM fiasco it might be this: An internal PowerPoint presentation released by the government that makes it clear the company went to great lengths to discourage people from talking frankly about safety problems, even if that problem scared them, their family, and was obviously a screw up. That's the gist of this unintentionally grim and morbidly hilarious 2008 PowerPoint presentation, released as part of the U.S. Department of Transportation's order fining GM $35 million and ordering them to revise their safety policies in the wake of the massive and deadly Cobalt ignition defects. This slide has a handy chart of words to avoid when reporting a defect. They include "debilitating," "crippling," "deathtrap," and perhaps my favorite, "Corvair-like." In one slide, they even ask engineers not to use the word "safety," but to use "issue, condition or matter" instead. While it's true most, if not all, automakers have specific guidelines for reporting problems, and they want reports to be as specific as possible, these guidelines come off as dismissive of safety issues. More than anything, they seem designed to shield GM from lawsuits and bad press, rather than build safe cars in the first place. The full presentation, including NHTSA's order, can be found here. What's the worst part? It's hard to even say.